Small, local changes with a lasting, global impact. Our campaigns are at the heart of everything we do. From encouraging small, individual changes to working alongside large organisations; we've got it covered! Take a look at our current campaigns below. Designed by our co-founder Harriet Lily, and built with the help of the youth of Leeds: The Forever Octopus is a wonderful display of sensory artwork, representing just one month’s worth of disposable plastics. Our new campaign aimed at 13-19 year-olds in Armley, UK. From January 2019, we want to empower the next generation to make a difference through artwork, media projects and community engagement workshops! Applications have now closed - watch this space for updates! Photo credit: Yorkshire Life Aquatic C.I.C. We are hugely excited to be working alongside Yorkshire Life Aquatic on their fantastic Human Aquarium project, funded by the National Arts Council. The exhibition highlights the plight of marine mammals held in captivity around the world. It will take place in February 2019 in Leeds, UK for its world premier. We will be running Plastic-Free Feb in February 2019 - this year bigger and better! Watch this space for updates. For the whole month of June 2018, we teamed up with mummy blogger Mamalina and challenged parents to think about their waste as a family. Focusing on a different area of family life each week, we've got you covered from from breakfast 'till bedtime. In January 2018 we began our '#stopsucking’ social media campaign. We challenged the masses to post a photo with their last straw/reusable alternative and pledge to '#stopsucking on plastic once and for all! Want to join in? Simply upload your photo with the hashtag on your social media. We ran Plastic-Free Feb for a second year - again with huge success. 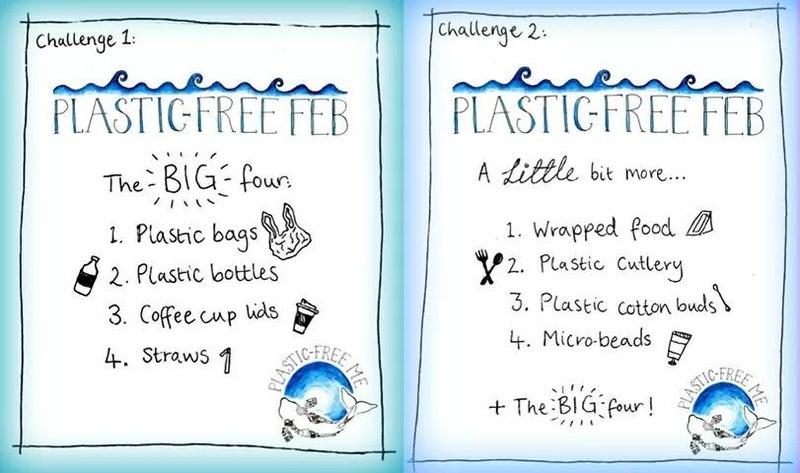 Three levels of challenges, from a few, simple changes to a whole month with no disposable plastics! We produce a staggering amount of plastic waste at Christmas alone in the UK. In december 2017, we challenged our followers to get creative and show us their best alternatives-to-plastic for their gifts, wrapping, food and fun over the Christmas period! We had great engagement and a huge thanks to EcoGlitterFun for their super sparkly, biodegradable prize. Our very first campaign was a huge success! We run it every year. Join us and many more in February for an entire month without disposables. Three levels of challenges, from a few, simple changes to a whole month with no disposable plastics! Plastic straws are one of the most common items found on our shoreline. Used for just a few minutes, do you really need that straw that will last hundreds of years? Stop sucking and skip the straw! Got a great campaign idea but need a boost to get it off the ground? Let us know!